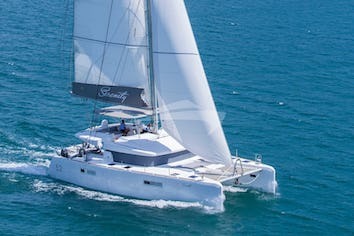 NOVA is not simply the flagship model of the world leading multihull shipyard; she is a unique custom made beauty, built by her loving owner with the sole purpose of serving the art of living! She brings to sea the art of architecture by the world renowned naval architects Peteghem and Lauriot Prévost, original art works by famous artists decorating her interior, culinary art of the highest standard by her Chef who ranked 1st in the 2015 Mediterranean Yacht Show “A” Category Chef's Competition and a crew that is truly dedicated to a single purpose: the art of hospitality! 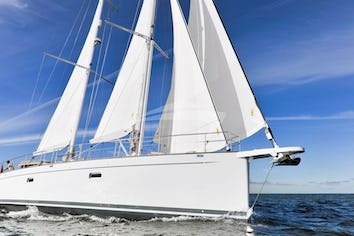 Costas is one of the most experienced sailing yachts skippers in Greece. He was born on the island of Hydra. He is married and has two young daughters. Costas started sailing at the age of 13 and is a professional skipper since 1989, on 50 to 65 feet mono-hulls and catamarans. Costas knows the Greek islands and coasts like nobody else: idyllic remote bays, good fishing spots, nice harbours and their best restaurants and bars, interesting sites to visit, etcâ€¦. He has friends on many islands, and knows the key persons and facilities that will help make your cruise a success, on most of them. 5.Rochet leaves with melon,feta cheese and balsamic vinegar vinegraite. 5.Santorinian fava with grilled octupus and fried caper leaves. Fourth cruise on Nova : we have archived the 67 knots of Meltemi! Thanks to Kostas talent and professionalism. We had a great time,relaxing and enjoying life thanks to Dina’s welcome. And exceptional lunch and meals thanks to Takis always there to please everyone! Thank you all so much for a magical and unforgettable trip to Greece! We will not forget the amazing food, sunsets, cocktails and laughter we all enjoyed on Nova. One island was better than the next and our kids learned to waterski which was a huge thrill for us all!!! Thank you for all you did to make this last part of our vacation so very, very relaxing and special! Thank you of a trip of a lifetime. 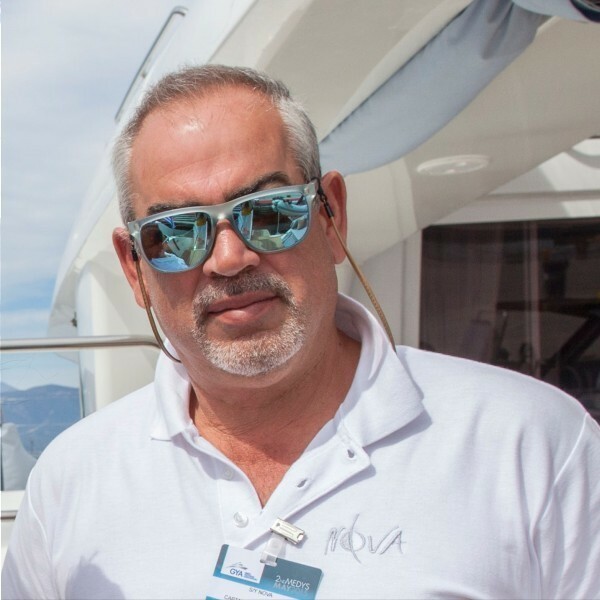 From the moment we boarded the Nova, we felt comfortable to be in your friendly and capable hands.Captain Costas you navigated through the most stunning beautiful waters, and brought us to the most magical destinations. The beautiful painting we bought of your hometown Hydra will occupy a prominent place in our home. Thank you as well for all the fun water activities you are the greatest! Dina you are super you assisted the Captain, tended to the Nova, and catered to our every need without skipping a beat, we love you! Takis the meals that we enjoyed on the Nova were by far the most delicious we have ever had. The perfection was extraordinary, and best of all…Your charming presentation! Thank you for everything! Captain Costas you had by exampleof take us all confident and comfortable that you get us to the perfect place!And you did! Our memories will last forever! On board Nova, great job really,skiboat and tubing! We especially loved your hometown of Hydra! Dina your warm welcome, enthusiasm and pay attention enhanced our experience! You are also so much fun to hang out with! You are the‘’saltiert DOG’’ as you do it all! We are so appreciate! Thank you! Takis what can we say…We have eat at some of the best restaurants through the world but by far the best gastronomic experience we have ever had was with you! You are in a class by yourself as a real culinaryartist! We love you Nova Crew! This trip was our bucket list and you exceeded our expectations. The food, champagne, sunsets and the exclusive bays for swimming created so many memories. We felt at home immediately and each of you anticipated our needs, even when we invited friends to the boat for an evening happy hour. Every day was very special and we particularly loved our days inHydra, our new favorite we can’t want to be back! Costas, you are a dear friend and a treasure. The memoriesof each of the 14 trips we have taken together over the past 21 years you have shared your beloved Greece with us, Aegean, Ionian, Sporades, Dodecanese,Peloponese, Cyclades, Halkidiki, even Turkey and I have loved every minute ofit. Somehow, each trip has been more perfect than the last. But this last trip has been special, in so many ways. Thank you my friend! You are the most extraordinary crew…thank you for making usso comfortable and happy. Dina, you have been our leader and expert of everything! Takis, each meal was a delight-fresh, delicious and beautifully presented. Dina we loved your table settings!!! Thank you both, and I hope we sail together again! We had high expectations on this cruise but Kostas, Dina and Stelios you really managed to surprise us with your professionalism and the way of doing things in detail. Kostas you can be very proud of your crew! Where on earth you found lovely Dina? A person who is talented in so many ways: her positive attitude, eye on beautiful table settings, excellence in customer service and ability to be everywhere to help us all just in the right time, as if she could read our minds. Stelios is the master chef. We enjoyed every meal. A couple of times I got tears in my eyes simple because the food was so delicious and beautiful. Kostas you are a captain with high professionalism and camling personality. Your taste in music is fantastic! In Arnold Schwarzenegger’s words: WE WILL BE BACK! Love, Satu, Markku, Lina, Katriina, Mikko, Klaudia & Kaius. The week was the best we could have hoped for and we had a wonderful time. For two of us, who were apprehensive about sailing trip, the whole experience was a relaxation. To Kostis – thanks for applying all your local knowledge and sharing with us all the great places in the Cyclades. To Dina – you are like us and always in good humor and managed all of our needs. Thank you!!! To Stelios – your food was amazing and you should publish a cook book. We would buy it! We have gained weight but have no guilts! Bravo! Nova is a wonderful yacht with wonderful people. One word describes this vacation aboard Nova- Epic! Exceeded our expectations on every front, from the most amazing food with crazy good service. Dina Rocks and Costas is Fantastic, always a calming presence. We are a parry f 8 ( 4 couples) from the USA- Man of us first trip to Greece. I hope to return soon. We had an amazing time, some of the best food we have ever had and the service was impressive. First time to Greece and I can’t imagine seeing it any other way. BEST TRIP EVER. Thank you so much for your amazing service and friendship. Too many moments that will last a lifetime. Can’t wait to do it again. You are an amazing team- A force of love of Greece and the desire to host us through its beauty. Thank you sharing with us your quick to smile faces every morning for taking impeccable care of us. You made us all feel like FAMILY! Thank you for the amazing week on the Nova boat. We had a great time thanks to the exceptional crew. Thank you Costas for the beautiful places we visited the funny rides, the wakeboard and for letting us jump from the boat. Thank you Dina for the beautiful tables, the funny nights and most of all your smile. Thank you Costas for the delicious food, the nice dish presentation and the birthday cakes. Overall we loved the trip thanks to all of you. You are the best we’ll miss you all! Julien, Jean, Crystelle, Benedict, Victoria, Alexis. The trip with the Nova was a new experience for our family, with our 4 daughters. Costas brought us to beautiful little bays and caves with lots of privacy and a lot of fun for the kids. Costa’s cooking was amazing! We had so many local dishes, fresh fish and traditional Greek dishes. From breakfast to dinner, it was all perfect. All in all we had a wonderful time with moments we will never forget. We will certainly come back to Greece to make more cruises. We all hope to see you again! Many many thanks for a wonderful time from all of us. Pim, Simone, Nathalie, Stephanie Charlotte and Sophie. You made this dream reality! And you have made our holidays have been so fantastic ! We hope to come back another occasion and then enjoy again the nice food …..cooked by Nasos, the table decoration, the joy and sympathy, the manicure and dance of Dina and of course, all the care, professionalism and sence of humor of our captain Costa. 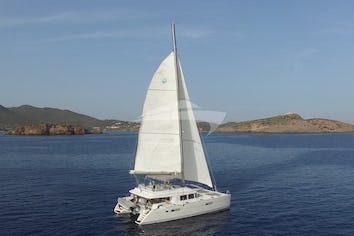 Looking forwards you’ve enjoyed a bit of our stay in your beautiful catamaran NOVA !!!! We enjoyed a relaxing cruise in the northern Dodecaneseislands. Nova is extremely comfortable compared to its peers, with perfect layout and excellent seakeeping.. The crew has been professional and reliable in any aspect. Food on board was delicious and better than any restaurant ashore. Thanks Captain Costa, Nasos and Dina. Thank you for the lovely week onboard this beautiful yacht. Thank you most wonderfully for our magic days on the Greek waters and Islands. To the home of Odysseus and the caves and secret places upside down white trees! Of course the magic kitchen of Naso and lots of Mousaka and eggplant made our nose and tongues happy while we enjoyed the fresh air and rising of the moon. You managed the dance lessons, swimming and our menus wishes with pace and smiles. We made offering to Poseidon for good waters, gentle winds and private beachesin lovely settings. Thank you again for allthe great memories and wishing you happy trips for your future as we miss our magic trip and and dream of our next voyage and Odyssey. Unforgettable trip! !With a lot of beautiful memories with lovely companions!! Thank you for the best time on this trip.Everything was great and we had an amazing time.We loved the food and the service!! Costas, we had a wonderful time aboard your beautiful Nova Catamaran in between lovely nature, marvelous bays and unbelievably clear water. We were very impressed by the beauty of all the places you took us to. Nasos, you made us most happy with all your delicious meals. Further than that you gave us the feeling of safety with your nautical skills. Dina, we were very thankful to have you with your warm hospitality an board with us.